When you buy a new pair of shoes, what is your thought process? Granted some shoes don’t apply to the second question and are purely there for vanity reasons, but when i invest in shoes, particularly boots, I know they have to answer yes to both of those questions. So when Cloggs got in touch to find out if i would like to choose from the wide selection i went straight to looking at which pair where going to answer both those questions for me in the affirmative. It was a LONG evening of deliberating … shoe shopping is hard when there’s just so many good shoes! All my favourites on the style and comfort front, like Joules and Barbour for practical wear, Uggs & Sorrell for ultimate warm toastie feet and Ash and Hudson for cool stylish boots… what’s a girl to do ay? So seeing as i already have some tan and some black boots i went for the wild card.. These Hudson Lizard Boots. And i freakin’ love them. Double zip fronted, with the most amazing lizard print. These are some seriously cool boots. And even though they may be the wild card i’m thinking that they will still be versatile and plenty re-mixable. 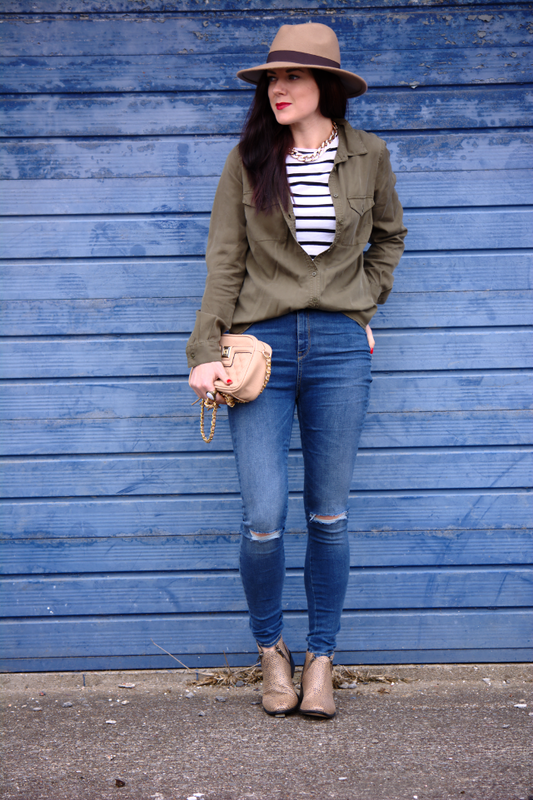 Here’s two outfits i’ve worn this week with them; one casual, one smart(er). I opted for one of my favourite casual combo’s right now, ripped jeans and layers. 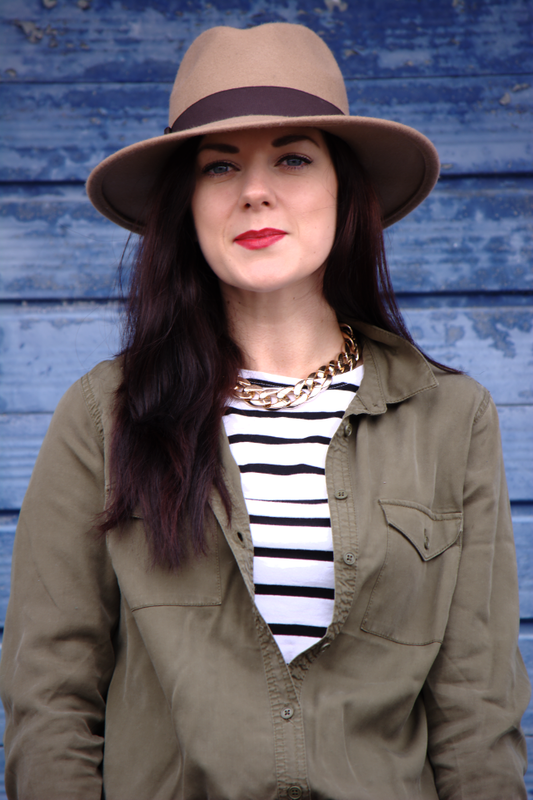 Starting with the stripe top, then on with the khaki shirt and finished off with the camel coat. Casual and comfy.. my favourite kind of style. 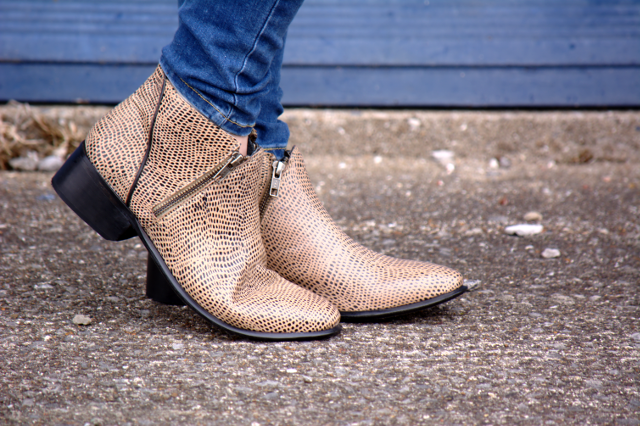 The wonderful thing about these boots is the print is subtle, lizard print, like leopard print can act just like a neutral, making them super easy to wear. I knew these boots would look awesome with black skinny jeans, and i know that will be in their not so distant future, but i wanted to see if these boots would work for a smarter outfit, a dress in this case. I actually loved them paired with the dress. With a short black dress like this, i love to reign it in a bit and pair it down slightly with flat boots, making the outfit more accessible and much more wearable than teetering in high heels all day. 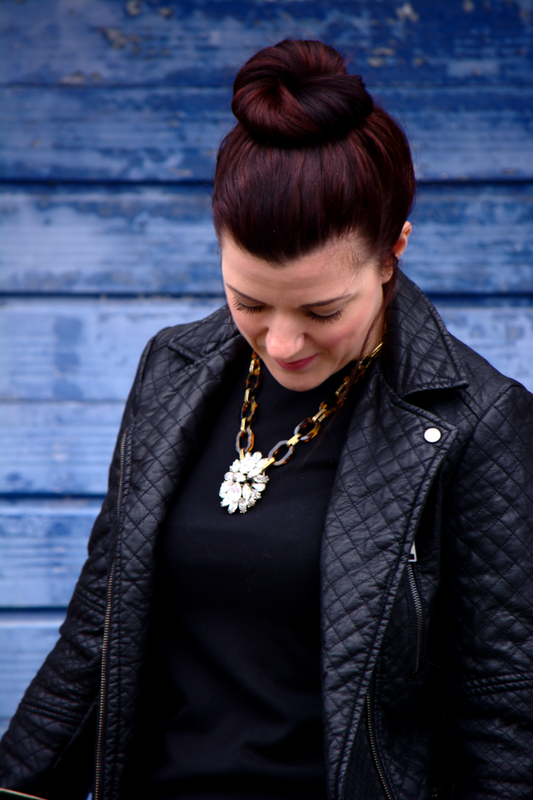 I added the biker, one of my favourite statement necklace and a simple clutch and i was comfy but smart! 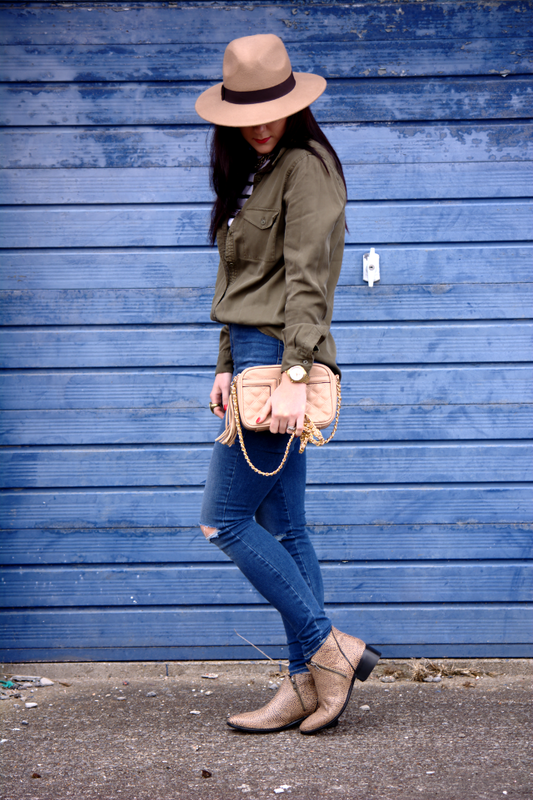 I actually have a HUGE crush on these Ugg boots also, (have a look… not your typical Uggs i promise you!) They look divine.. and again, how wearable and remixable! I have to say, i am a huge boots girl and come summer i will miss them (although British summers sometimes still require boots). So there we have it, one pair of boots two ways.. and many many more to come i am sure!! Do you have a pair of shoes/ boots that work hard for you with your wardrobe? Beautiful outfit, looking forward to recreating the first look. Thanks for the linkup. Those boots are great! I like the first outfit more because I just love hats. However, I tend to wear more elegant outfits so the second is a great inspiration, too. Great versatile boots, I especially like the first outfit, cool casual. Yay you went for the boots Rachel! They're absolutely stunning & like you say are going to go with many outfits just perfect! Those boots are gorgeous! Love both of your outfits and it shows how versatile those boots are! My favorite, though, is the casual look with the jeans and hat! Love those boots! I definitely have several pairs that work hard for my wardrobe. Those jeans fit you like a glove. I love the distressed. Those boots are sooo freaking rad!! You look awesome and I love how they work with both outfits! Thanks for hosting the link up! For me, low heel boots like these must have comfort since they would make great walking shoes and pairs well with both skirt & pants. Love how you styled them! Ah are those boots a pair of beauties or what?! Absolutely love both outfits you styled them with! Ooooooooo! Rachel… I'm livin' those booties. Great post and fun link up! I absolutely love how different these two outfits are. One is effortless and casual, and one is sleek and classy! Super cool boots! I love how you styled them both ways. I love that camel coat too! The second way you wore them is my favorite. Love them both, Rachel – your fabulous legs look as good in skinnies as they do in a short skirt, so it's hard to choose!!!! The pattern on the boots is great – love the neutral colour too. 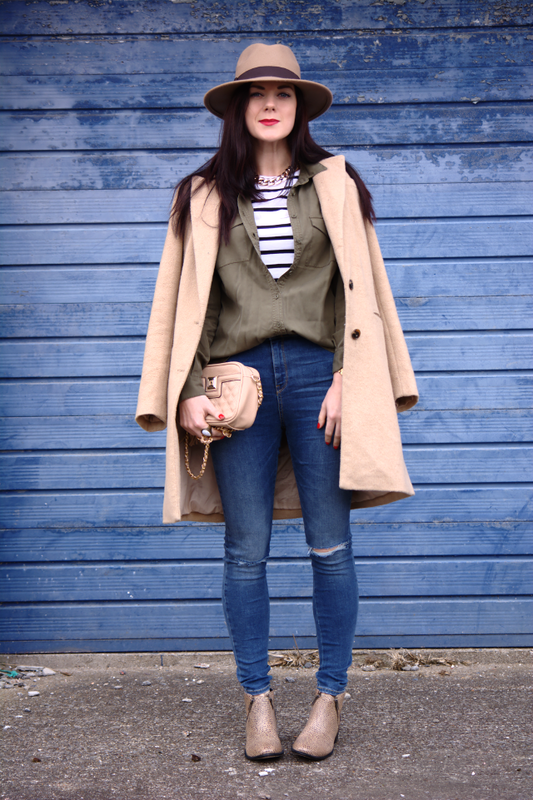 I totally want to recreate the skinnies look for myself… consider yourself well and truly pinned. I love how these boots shimmer gold! It's as if they're metallic or something. Love them! Excellent choice! !And lucky girl! Two totally inspirational outfits. I'm not sure what to wear this morning….maybe it's time to pull out my LBD like this one and pair it with a neutral print. I don't have lizard booties (read want!) but I do have leopard. Thanks Rach! I had no idea what to wear to work this morning….